First you start off with one pen… One simple fountain pen. Then you acquire a bottle of fountain pen ink. Then whoopsies you threw off the equilibrium of the universe and now have two bottles of ink but just one pen. That must change. Soon another pen crawls into your arsenal and brings a friend. Once again the unbalance is heartbreaking and destroys your karma so you get some more fountain pen ink. 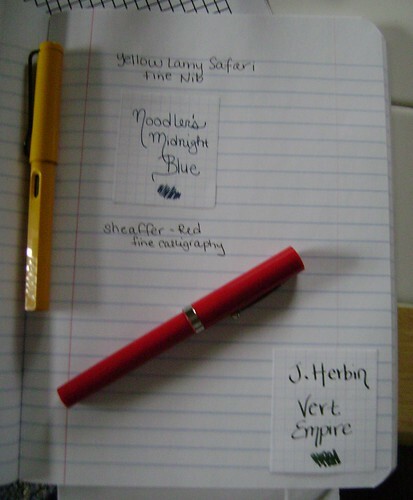 So you have pens and inks coming out of your ears and its so easy to forget what pens are inked with which delicious color so I’ve thought of a great way to utilize those Rhodia No. 10 notepads we all have. You have one too right? 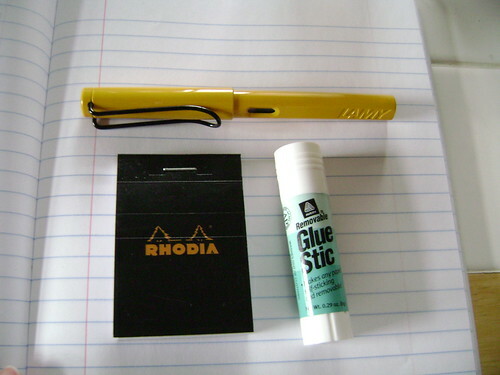 The cutest most adorable little two by three inch pads of luscious and cooperative French Rhodia paper? If not you’ll just have to find one or two or three. (Yes I have issues with paper too). 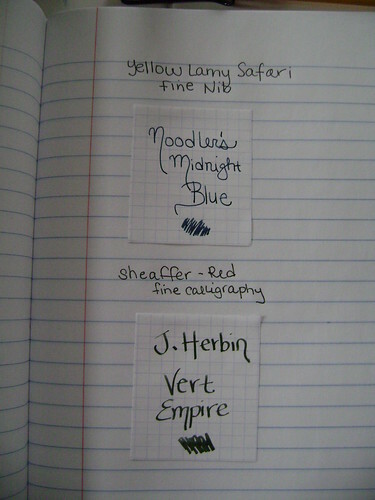 First thing you’ll need to do is decide which notebook you are going to log your pens and inks in. This step is easier for some than for others. Next grab your removable glue stick. 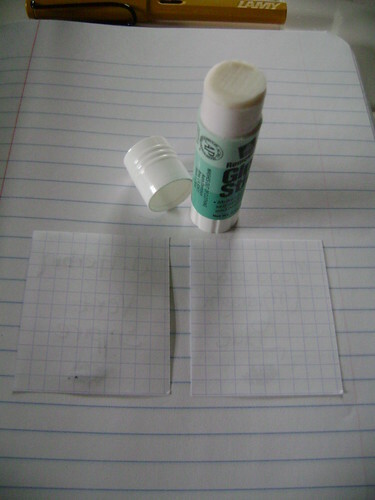 If you have never heard of removable glue sticks, you are in for a world of fun. 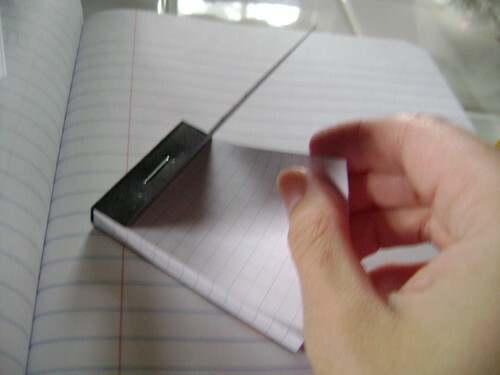 They allow you to turn a piece of any paper into a removable sticky note. Mine is Avery brand but I am aware of other companies putting out the same product. Tear out one of those cute Rhodia No 10 pieces of paper. Write your ink name on it. Add a nice swab of it if you’d like or anything else that will help you recall why you adore that ink so much. After the ink dries, flip over the paper and apply your removable glue stick. I let it dry for a bit before the next step. 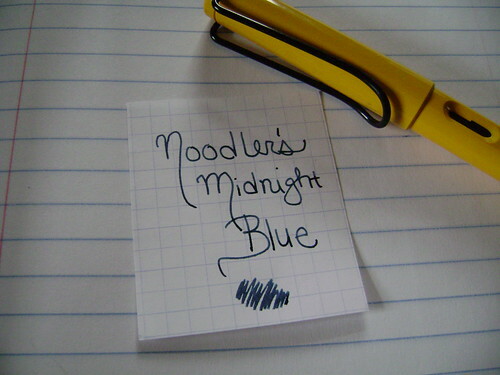 In your designated notebook stick the ink under the name of the pen in which it is loaded. TA – DA~! Its simple, its easy, its environmentally friendly. And best of all – you’ll always know what pen is inked and with which of your oodles of inks. Don’t limit yourself to just an ink tracker. You can also create ink menus. Its autumn so maybe mix and match your ink swatches to create a great complimentary palette and then get to flushing those fountain pens! Or maybe you like keeping your bottles in spectrum order – why not have a record of what ink is in which bottle so you don’t have to disturb them all to refill. The possibilities are endless. Hey, what a great idea. I have an adorable Rhodia No. 10 notepad that I’m not using, but I hate to use it up because I don’t know where to get more. (My local Rhodia retailers don’t carry this size, woe is me!) But I really should bookmark this and try and use it at some time. Super good idea. Great idea! This makes my rotation log look so shabby! Great idea! I did not even know they created removable glue sticks….time to go to the office depot! I love the way you write! This is actually a comment directed to a bunch of posts, but here’s where it landed! PS. Pen/ink tracking is a really good idea.